FreeCharge has for a quick and easy method. It not only offers big bonus offer to its new users but Jaw dropping free charge promo codes for its loyal existing users as well. You can grab up to 50% cashback on mobile recharges and bill payments; up to Rs 250 cash back on Gas, metro and landline bills; up to flat Rs 300 off on movie ticket bookings and flat 40% off for FreeCharge wallet users and much more. FreeCharge brings to you the benefits of the best services accessible with deals which makes your wallet hotter and makes you a smart shopper. Started with the basic facilities of recharges and bill payments, FreeCharge is now connected nationwide to more fields of home services, medicine, travel, entertainment, and food. 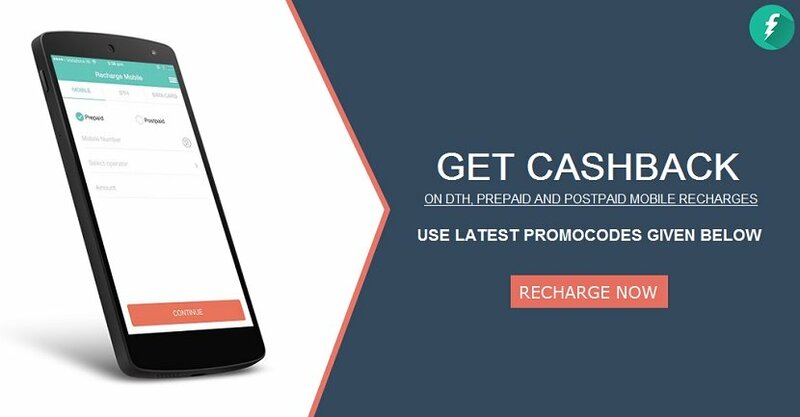 FreeCharge brings to its old users discount up to 50 % cashback through the FreeCharge app. You can use the given code for mobile recharge and mobile bill payments.This code can be used to do recharges for mobile, DTH, metro & bill payments for mobile and electricity also. To avail, this offer on dth recharges you can use Freecharge Coupons listed on PaisaWapas, you will have to use the code: TV100 and get 20% off. The offer is valid for minimum recharges of Rs.50. Maximum cash back under this offer is Rs.25. The money will be added to your FreeCharge wallet within 24 hours of the transaction. Offer is available on both FreeCharge app and website. Offer can be availed twice by each user. With the FreeCharge app, adding money to your wallet comes with a bonus. By adding a minimum of Rs 1000 to your FreeCharge wallet you can earn up to 50% cashback in your wallet. By using the coupon code you can get an assured return of Rs 20 and maximum of Rs 500 in your wallet. Cashback will be rewarded instantly after your transaction in your wallet. Offer valid on FreeCharge app and website. Now watch all the most awaited movies by you on your nearby theatres. As FreeCharge makes booking your tickets very reasonable. FreeCharge movie ticket offers to its old users a deal with cash back up to Rs50. 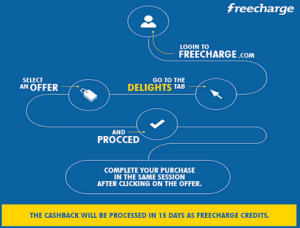 Freecharge Cashback Offers valid on the transaction of Rs 150 and more. You can avail the offer on both FreeCharge app and website. No FreeCharge promo code is required to avail the offer. Save electricity and save money on your electricity bills. Pay your bills through FreeCharge wallets while checking out and get up to Rs 100 cash back (10%off) on your bills. Get maximum of Rs 100 cash back. The minimum amount is Rs 500 to avail the offer. Online shoppers – now shop in your budget. Pay through your FreeCharge wallets while checking out and get cash back up to 9% on your orders. Shop in your favorite sections of men /women cloth wears, footwear, electronics and much more and avail discounts up to Rs 1800 off on your shopping spree. Coupon can be used by applying coupon code while making payment with your FreeCharge wallets. Maximum cash back is Rs 1800 on your total bill. Offer can be availed on eBay checkout. Pay your tax bills on H&R block and use your FreeCharge wallet while making the payment and get upto Rs 100 cash back on your paid amount. FreeCharge is the official wallet for H&R block. No minimum limit on the billing amount is required to avail the offer. Cashback will be credited within 24 hours of your tax payment. Make your bill payments through the FreeCharge wallet and avail great discounts and benefits on your payments. Get flat 20% cash back on Mahanagar gas bill payments. Maximum cash back available is Rs 50. Use the given code on your FreeCharge apps or websites. You can get up to 40% off on food orders with some exclusive stores like food panda, swiggy and much more. Freecharge, in collaboration with FoodPanda, gives you a chance to get up to 40% off on food orders made from the website or mobile app. This offer is available for existing users only. To avail this offer, use coupon code: FC40 and enjoy your favorite food at amazing discounts. Grab this limited period offer now because such benefiting offers do not last long. Order the food of your choice from Zomato and get up to 20% off on the total bill. Not only this, you also get an additional 20% cash back under this offer. Just use the coupon code: FC20 and make this offer your money saver. Use this offer and get up to Rs.75 off on your food offers. You can also get an additional 20% cashback on orders made through swingy website or mobile app. Apply the coupon code: NEWFC. avail this offer before the great deals end. How do you avail offers on FreeCharge? You can download the FreeCharge app on your phone, computers, tabs, or laptops. You can access the offers on the FreeCharge website as well. You can both make payments and accept payments on the app. FreeCharge is available on Google play store, Appstore, and Window store. Here is how you can reach and redeem the sale offers. Select the category you want to make the payment in. Select the payment method and apply the coupon code. Enter card details and verify OTP. In some of the cases, offer has to availed from the website you are shopping on. For example: if you order a take out from Swiggy app then while checking out to make the payment you have to use the option pay through FreeCharge wallet to avail the offers and then the discount would be applied automatically. FreeCharge is available to you anytime anywhere. Here you can keep adding money and cashback to your wallets without having to worry about it getting expired. Day by day FreeCharge is getting connected to more and more services, thus giving to you more and more offers and exciting deals. It is fast and simple with excellent services. FreeCharge is the leading e-commerce websites and most admired app by the digital payment Indian users. You can avail a wide range of offers and coupons while making your monthly payments. You can carry money digitally without having to worry about cash. FreeCharge provides a safe and secure platform for your digital payments usage. FreeCharge makes your weekend checklist to do -nothing but chilling. Paying bills is no more an obligation but just one tap on your phone with add-on gifts. Hurry and grab on the best of the deals! Many other store is also giving bill payment cashback & offers like: Paytm Coupons, Mobikwik, RachargeitNow and manu more.